Look! Up in the sky! It's a bird! It's a plane! It's-- wait, who is it? Superman programmed Cyclotron with complete knowledge of the strengths and weaknesses of every hero and villain. Superman hoped that Cyclotron would become the ultimate tactician, able to anticipate the moves of villains based on the prior tendencies and recognize heroes unfamiliar to League members. The android could disguise himself as human and, although he had limited physical abilities, he could rotate his torso and deliver a powerful "twister punch." That really seems like a bad idea, doesn't it? Every time Superman gets around robots, things go to hell. There's Brainiac, obviously, but also the robot duplicates he uses every so often to have Superman and Clark Kent appear at the same time; they usually end up going crazy and trying to take over the world. Maybe that's why this one has "limited" physical abilities? It does raise the question, though, of why a computer needs physical abilities at all. 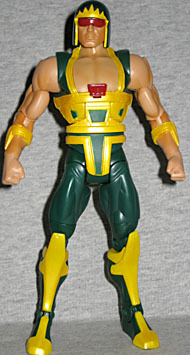 Cyclotron is an update of a character invented for Kenner's Super Powers toyline. 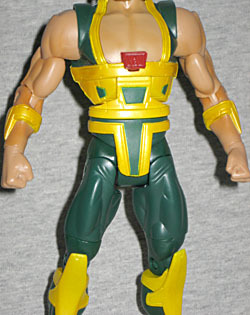 He came out in the third series of figures, in 1986, but DC already had a character called Cyclotron. You'll remember him from the Atom's revamped origin story. Did Kenner know DC already owned the name, or did they just pull it out of a hat? This isn't just a case like Mantis, Steppenwolf or the Parademons, where the character was redesigned but is still fundamentally the same - this is an all-new guy. Obviously Mattel has finally paid off whatever crippling balloon payment it was that was kneecapping their profits on this line, because there's been less re-use and more new sculpting on the DCU figures recently. Good thing, too, because Cyclotron would never have worked as a plain repaint. His costume is just far too detailed to convey with nothing more than paint apps. He has raised elements on his feet, shins (including big points that cover the knees) and forearms, plus a separate belt/loincloth thing that fits over the waist. His shirt-thing has lots of technological detailing on the straps, and flared shoulders. There's also a big red button on his chest, but that has more to do with his action feature than his sculpt. Yes, action feature. 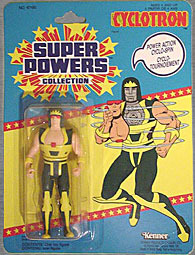 The Super Powers figure had a wind-up "power action cyclo-spin" - you know, like Sy-Klone. That only survives on this figure as a reference in his bio, not anything physical. However, his other action feature was a flap of skin that could be removed to reveal his robotic innards - yes, obviously someone in Kenner's design department went to see Terminator before sitting down to work on this one. On the original, the face and chest skin were all one piece, meaning he didn't have any neck articulation when in his "human" mode; that's not good enough for Mattel today, though, so they made the chest and face two separate pieces, retaining full motion at all times. The robotic innards are highly detailed, yet still clearly based on the old toy. There appears to be a speaker in the center of his chest, with hoses flanking it. Three knobs are aligned along the clavicles. The face has tiny red eyes, a square nose, and a very traditional "speaker" mouth, like lots of old robots had. When the face is removed, you can see more tech detailing under the lip of his helmet. Cyclotron's weird helmet was originally meant to conceal the fact that he didn't really have a neck - that's why it looks so much like a bucket. The modern one is a little better, but there's still only so much the Four Horsemen can do. The articulation is all the DCU standard, since the removable pieces don't get in the way of anything. His neck is a little loose, though, so while he can't look up or down, it bobbles around when you move him. Other than the skin, Cyclotron doesn't come with any accessories. 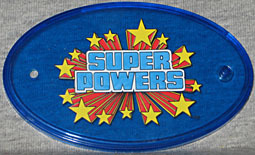 He does come with a translucent blue display base, stamped with the Super Powers logo. It's still funny to see a Mattel product with a logo that used to belong to Kenner, their competitors, but otherwise, this thing serves no purpose. The figure stands fine on his own, as most of them do. 2010 is DC's 75th anniversary, and Mattel is helping them celebrate by including collector buttons in each package. 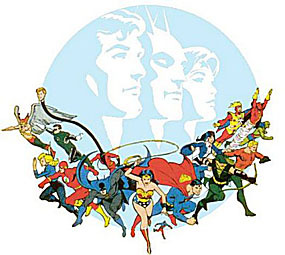 Cyclotron's is the first to feature art not from a comic, but from a piece of stock art from Jose Luis Garcia-Lopez. Since it was designed as a standalone piece, it works really well in the "button" format, with very little cut off. Cyclotron is a character absolutely nobody cared about. He was only available in the final series of Super Powers toys, and never once appeared on the Superfriends cartoon. When he was announced for DCU Series 13, Google searches for who he was went through the roof. But Mattel and the Horsemen have done their best updating him, and just because he's not famous doesn't mean he's garbage.